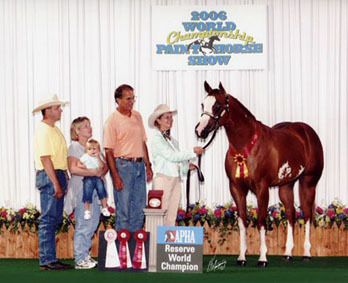 One of the most highly credentialled modern APHA Stallions is now in Australia! 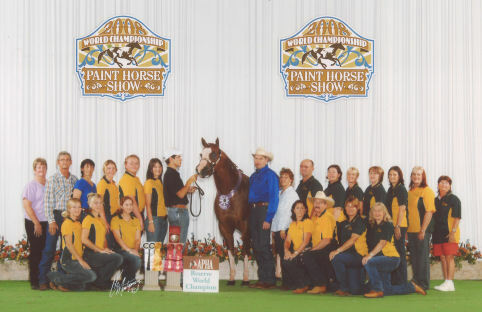 WOW what an awesome experience we had at the APHA World Show and an experience that I will cherish forever. 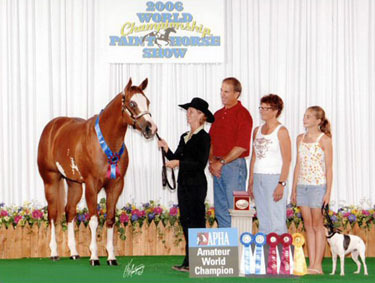 I am so proud to have accomplished an Open Reserve World Champion Title with our own horse and can now say the very expensive exercise was very much worth it! Spike had an amazing fan club and they all brought the arena alive when we all cheered for him, we made so much noise that the official photographer even turned around to take a photo of our crowd! I would personally like to thank all the Australian Youth Team, Team Managers and Supporters for being there and cheering for Spike as well as our many USA friends, that in itself made it so much more special. I would also like to thank immensely Fred Tabor and all the team at Tabor Ranch for making our dreams come true and taking the very best care of Spike, we can't thank you enough! You are the best!!! around him, he is no doubt a people magnet!!! 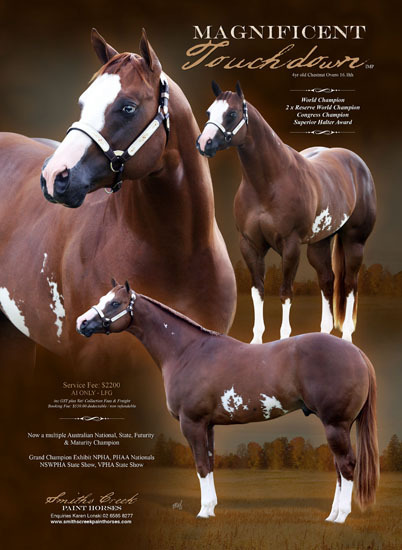 MAGNIFICENT HEIR - APHA is the # 6 Leading Sire of Halter Horses 2006 and 2007 and he has sired a WORLD or RESERVE WORLD CHAMPION every year for the past 9 years. 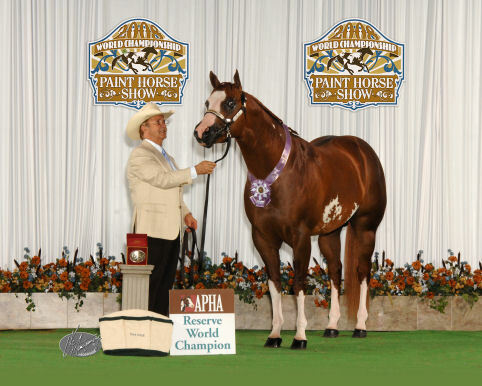 OH TOUCH ME TOUCH ME - AMQHA (Touchdown Kid x Mr Conclusion) a WORLD & RESERVE WORLD CHAMPION Producer and currently her 2006 filly is ranked # 3 in the current APHA Honor Roll being very close to jumping up to #2. 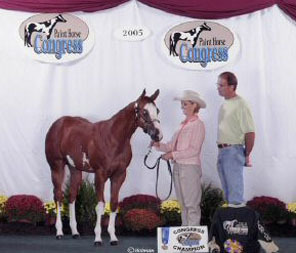 Oh Touch Me Touch Me placed 5th at the AMQHA WORLD SHOW in WEANLING FILLIES. 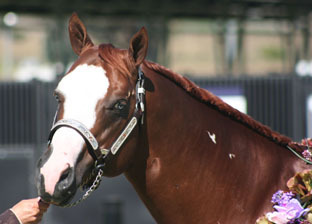 For many years now I had dreamed of importing a stallion and with a lot of hard work, dedication and saving I decided to start the ball rolling and began to look around for suitable prospects in the USA. 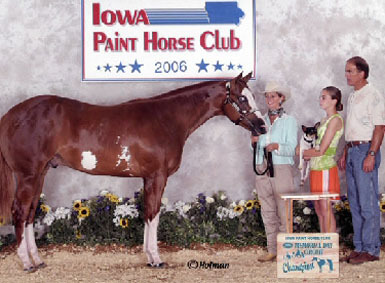 Almost every horse I really liked ended up being NH and so I soon realised that finding a GREAT NN horse was not going to be as easy as I thought. 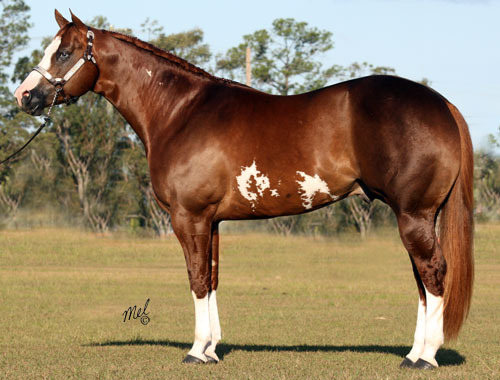 During Paint Horse Congress we met and spoke with Fred Tabor and told him what we were looking for and he told us he may just have that perfect horse for us. After Congress we visited Tabor Ranch and when "Magnificent Touchdown" was led out for our inspection I immediately got goosebumps all over and I knew in my heart that I had found my 'special horse' I absolutely loved everything about 'Spike', he is so correct and so balanced and so pretty especially with those two soft big blue eyes and has a lovely nature. He is currently 16hh and 16.1 at the hip and still growing! 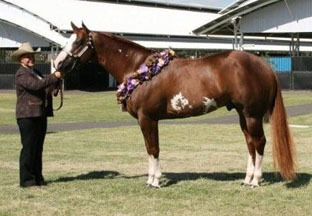 I can't believe that I now own a horse of this calibre and with a World & Reserve Title to boot! It is definately a dream come true for me. I would like to congratulate Deb Wartick on her World Champion title and especially her Reserve Open World Champion Title, a proud amateur against the 'big guns' what an achievement!. Thank you to all my friends in Australia and America for your help and being involved in our adventure! 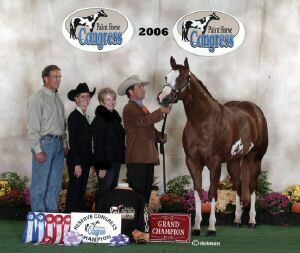 Like the add says: Colour, Conformation & Pedigree - He's THE TOTAL PACKAGE!!! We pride ourselves on being "people friendly" and would love to help make your dreams come true.